Turkey says allied forces have driven so-called Islamic State (IS) from the last stretch of the border with Syria which the militants controlled. The loss to IS would cut off key supply lines to the group in Syria and Iraq. It comes after Turkey and pro-Turkish rebels launched an offensive last month to clear the border of militants. Separately, Syrian state forces recaptured parts of Aleppo recently lost to rebels, reimposing the siege of the rebel-held east of the city. Turkish Prime Minister Binali Yildirim announced Ankara's military successes in a televised speech on Sunday. He said: "Thank God, today, from Azaz to Jarablus, our 91km of borderline with Syria has been entirely secured. "All the terrorist organisations were pushed back - they are gone." As well as IS, Turkey considers the Syrian Kurdish YPG militia to be a terrorist group. The YPG, which is backed by the US-led coalition, had been gaining territory in the north of Syria. Mr Yildirim said Turkey would never allow the formation of an artificial state in the north of Syria. 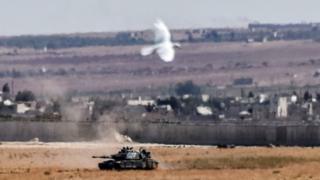 The UK-based Syrian Observatory for Human Rights said "rebels and Islamist factions backed by Turkish tanks and warplanes" had taken several villages on the border between Turkey and Syria "after IS withdrew from them, ending IS's presence on the border". Also on Sunday, Syrian government forces put rebel-held districts in the east of Aleppo under siege once again, monitors said. Reports said government troops had recaptured two military academy sites in the south of the city and severed a recently-established rebel supply line. Aleppo: Is besieged Syrian city facing last gasp? The government offensive was backed by Syrian and Russian air strikes. There are about 250,000 civilians living in the city's rebel-held areas. Aleppo has been divided by the country's bitter civil war, with various rebel groups controlling parts of the east of the city and pro-government forces the west. Pro-government forces slowly surrounded the city and in July cut off access to rebel-held areas. The brief supply line established by rebel advances early last month allowed some goods into the area but aid agencies have been unable to reach the population. Meanwhile, the US and Russia have failed to reach agreement on closer co-operation in Syria and a partial truce. Two days of talks on the sidelines of the G20 summit in China, which it had been hoped could lead to the delivery of much-needed aid to Aleppo, did not achieve a breakthrough, US officials said.